COMIC STORY ARC: Amazing Award Winner Movie on DVD! Directors: Josh Austin, Nate Barlow, Eric Manning, Russell Scott. 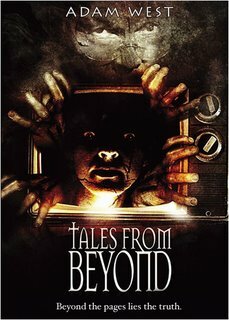 Tales From Beyond is a great movie on DVD! Great movies on DVD are released occasionally, but rarely great movies are released for Halloween. Until Now! Tales From Beyond distributed by Anthem Pictures won two awards for Best Picture at the Shockerfest and Shriekfest festivals in California. The movie stars Adam West as a bookstore owner showing a unique collection of books to a couple. The couple is trying to find the perfect book for a friend. The four books shown to the couple involve tales of the supernatural. The story from each book engrosses the couple with each tale. The tales whisks the viewer into mystery and suspense reminiscent of the Night Gallery and the Twilight Zone TV series. I had the opportunity to ask Nate Barlow a few questions about the movie Tales From Beyond. Nate, first I want to thank you for taking time to answer a few questions for Comic Story-Arc Blog. Which story out of the four stories did you direct in the film Tales From Beyond? I wrote, directed, and starred in Life Replay, the third of the four stories. All four were initially written in early 2003 and then shot later same that summer. So for those viewers who note the similarity to Click, Life Replay was first! But without a studio’s backing, it took a lot longer for Tales From Beyond to see distribution. I believe Replay plays a lot darker, anyway. While directing a film in this genra, how difficult is it between directing this style Horror as to directing a Comedy? I don’t really find one more difficult than the other, though each has its own set of requirements to be successful. The key to directing horror is in first properly setting the atmosphere. Lighting, music, cinematography, production design… whether you’re setting up a seemingly normal situation to turn on its head or whether you’re trying to unnerve the viewer from the get-go, all are critical elements. Once the mood is right, it all comes down to making the twists sudden enough or the images horrific enough that the audience will actually be scared. The number one rule of comedy, on the other hand, is timing. No matter how funny the dialogue or situations might actually be, if the director and actors don’t understand comic timing, the jokes will fall flat. Conversely, no matter how good one’s timing may be, if the writing isn’t funny, there is no saving the film. The actors really are critical in comedy, and good comic acting rarely receives the recognition it deserves when compared to dramatic acting. In directing the sequences in the bookstore, how was it working with a legend such as Adam West? Working with Adam was awesome. He was a complete professional and an absolute gentleman. I wrote the bookstore sequence, and at one point Adam took me aside to tell me how much he loved my words, especially the line, “Only you know you’re friends.” He said that when he first read the script, it was the one line that he hated, but as he lived with it more and more, that line grew to be his favorite. He delivers it perfectly—the nuances are very subtle. To receive such a compliment—what a thrill! Describe the feeling how you felt when 1) the movie was completed 2) Receiving Best Picture Awards at not one but two at the Shockerfest and the Shreikfest festivals? At the end of almost every shoot I’ve ever worked on, I’ve always had this sense of sorrow. You work so closely with the same group of people for so long that the parting can be quite sad. Despite the sporadic nature of the shoot (nights and weekends as opposed to straight through), Tales was no different. But when it finally came to completing post-production and having a finished film, I simply felt relieved. As for winning the Best Pictures awards… honored, excited, exhilarated. It’s amazing to have one’s work so recognized. ShockerFest and ShriekFest were on the same weekend. Eric and I attended ShockerFest; Josh and Russ, ShriekFest. We only found out later in the evening by phone that we had actually won two awards in the same night! Will there be a sequel to the movie "Tales From Beyond"? We have no immediate plans for a sequel. Tales was funded out of pocket, and we certainly don’t want to do that again! Now that the film is finally being distributed, if it does well and somebody else wants to fund a sequel, I’m sure we’d all be on board in a heartbeat. More so than a sequel, what I would really like to see happen is for the movie to act as a backdoor pilot from which to spin-off a TV series in the vein of The Twilight Zone, Amazing Stories and Tales from the Crypt. I think that would be the perfect long-term venue in which Tales From Beyond could continue to take shape and evolve. Who is your favorite director, and your favorite film of this genra? My favorite directors are Hitchcock, Kubrick and Gilliam. I also really enjoy John Ford. Several people have told me that they see elements of Hitchcock and Kubrick in Life Replay, which I consider the highest of praise. As for favorite film of this genre… since Tales crosses the horror, sci-fi and fantasy genres just as The Twilight Zone TV did, it doesn’t really fall into one specific genre, but my favorite horror films are The Shining and Psycho. Finally yet importantly, are there any other projects the fans should know about in the future? Eric and I are working on one horror concept, I have another all my own, and another friend and I are about to start in on a children’s fantasy. I also have several scripts already written in several different genres, some of which I would like to direct myself, others which I would be happy to sell to a studio or larger production company. I don’t have plans to enter production any time soon, but hopefully the release of Tales From Beyond will be a big step in finding financing for my next project. Any agents, managers or producers out there… give me a call! Tales From Beyond is one of the most enjoyable movies of horror on DVD I have seen in a very long time. The production quality was fantastic. Very definitive acting and excellent directing makes a great movie and Tales From Beyond is a great movie. The directing by Josh Austin, Eric Manning, and Russell Scott along with Nate Barlow put the “C” into creepy with their collective skills in directing.